Criminals, competitors, and nation-states have all discovered the value of hacking from the inside. Even your own employees plan to take your sensitive data when they leave. Is it any surprise then that insider threats have increased, as have avenues to profit from selling sensitive information? Raphael has done pioneering work championing the importance of unstructured data governance and educating organizations on data protection and security. 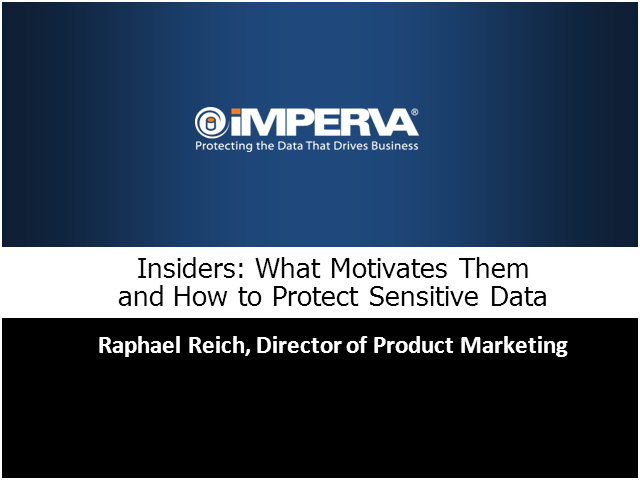 Prior to joining Imperva, Raphael held senior positions at Varonis, Cisco, Check Point, Echelon and Network General. Additionally, Reich was a software engineer at Digital Equipment Corporation. He has over twenty years of business experience and holds a bachelors degree in computer science from UC Santa Cruz and an MBA from UCLA.